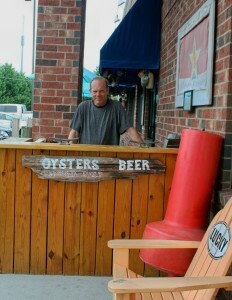 Bill Wade was born in Maryland and raised on Chesapeake oysters, crabs and rockfish. He is beloved by restless shuckers and feared by all-you-can-eat oyster festival hosts because of his voracious appetite for bivalves. Susan Elnicki Wade has worked at restaurants in Pittsburgh, New York, and Washington, DC. As a water-to-table seafood enthusiast, she scours the Bay in search of new ways to prepare oysters. Her articles have appeared in MarinaLife Magazine and Washingtonian Magazine. The Wades wrote Crab Decks & Tiki Bars of the Chesapeake Bay, a popular series of travel guides that cover crab houses and tiki lounges in Maryland, Virginia and Washington, DC. They have 20+ years experience in the publishing industry and live in DC with their two sons and a lively Siberian husky.